Zer! I have been obsessed by Voïvod since that day in May 1984 when I bought "war and pain" merely because of the cover art (and because it was released on Metal Blade, and I had just bought "Haunting the chapel", zerrrrrrrrrrr). I really had no idea what to expect musically (zer, I sure did hope to get some intense noise, but in those days you could buy something that looked heavy and end-up with a Scorpions rehash like Trance, or light pseudo thrash like Savage Grace, Omen or Lääz Rockit). Zer, so naturally on the first listen Voïvod completely blew me away (zer) like nothing else, not even Slayer. It was like re-discovering Venom and Discharge. I was flattened. I was wondering how human beings could get to produce such a perfect album. Then I proceeded to carve the Voïvod logo on every table in my high-school. 25 years later, now that we are old, fat and rotting, we can enjoy the comfort of a 30 years+ long retrospective of the art of Voïvod in a single book, and a very nice one at that. Large, glossy and full of anecdotes, like a long interview/bio that does not focus on the art only. 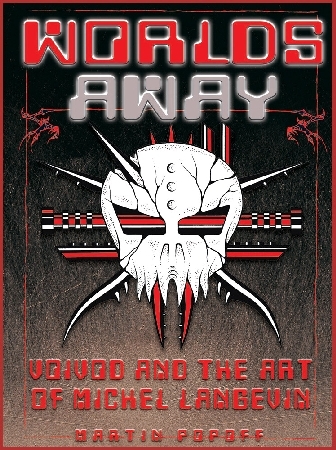 It's an interesting read if you're a Voïvod addict (if not, eat a rat), but of course the art is the main course here with full pages renditions of the Voïvod album covers and many other incredible and creepy paintings and drawings from Mr. Langevin's portfolio. Got my copy on Saturday, merci Millenium! M. Langevin was there, so I asked for a signature. My first autographed item ever... ZERRRRRRRRRRRRRR!R!R!R !R! R! !RR!! R !! Ce livre, il faut que je me le récupère. J'ai toujours adoré l'art de M.Langevin, ainsi que celui du mec de Sadistic Exekution.